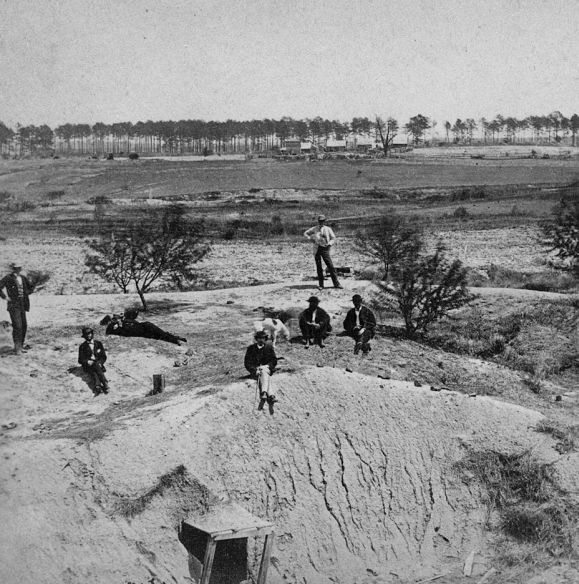 Crater with Union soldier in 1865. Battle of the Crater, Petersburg, Civil War. 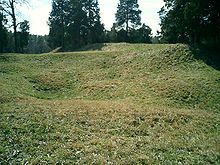 Introduction: The Battle of the Crater, popularly known as the Mine of Petersburg, was a Union assault against the Confederate works in hopes of effecting an unopposed breakthrough. Whilst the trenches of Richmond-Petersburg was scene to the longest siege in American warfare, it had unfolded in a methodical manner. For nearly every attack the Union made around Petersburg another was made at Richmond and this coordinated movement strained the Confederate's manpower and resources. Through this strategy Grant's army gradually and relentlessly encircled Petersburg and cut Lee's supply lines from the south. For the Confederates it was ten months of hanging on, hoping the people of the North would tire of the war. For soldiers of both armies it was ten months of bullets, artillery, and mortar shells, relieved only by rear-area tedium, heat and sweat, drill and more drill, salt pork and corn meal, burned beans and bad coffee. It was this piecemeal carving of earth while living in mud, known as trench warfare, that would become common place some 50 years later in Europe during the First War. (Right) Approximately 90,000 of these Union Ketchum grenades were made and then employed at both Vicksburg and Petersburg sieges. 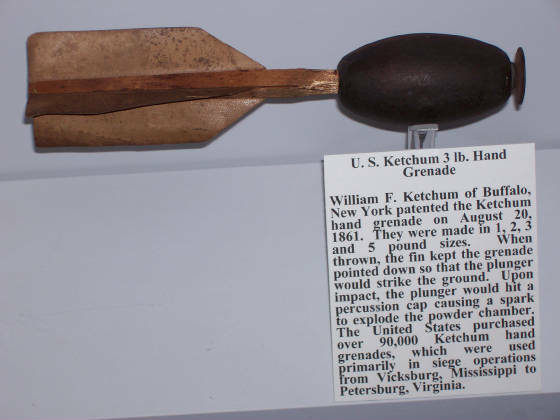 The Confederates also had their version of the Ketchum, known as the Rains Grenade. It didn't take long for the soldiers of both armies to realize that these weapons posed a threat to anyone who gripped its base, for many men had made the effort to throw or lob the grenade, only to be blown-up in the process. Heavy, some weighing as much as a modern-day bag of sugar, the grenades were generally dropped or tossed down into the trenches rather than thrown or hurled in an arc manner. Click for graphic view and description. Courtesy Texas Civil War Museum. Summary: On July 30, 1864, after weeks of preparation, in Burnside’s IX Corps sector the Federals exploded a mine beneath Pegram’s Salient, blowing a gap in the Confederate defenses of Petersburg. From this propitious beginning, everything deteriorated rapidly for the Union attackers. Unit after unit charged into and around the crater, where soldiers milled in confusion. The Confederates quickly recovered and launched several counterattacks led by Maj. Gen. William Mahone. The break was sealed, and the Federals were repulsed with severe casualties. Ferrarro’s division of black soldiers was badly mauled. This may have been Grant’s best chance to end the Siege of Petersburg. Instead, the soldiers settled in for another eight months of trench warfare. Maj. Gen. Ambrose E. Burnside was relieved of command for his role in the debacle. Although Burnside successfully captured Knoxville, Tennessee, he was considered and labeled a failure at the Battles of Fredericksburg and Petersburg. The Battle of Fredericksburg, however, is generally referred to as General Robert E. Lee's easiest victory. Regarding the Battle of the Crater, General Grant summed it up best for the Union saying it was "the saddest affair I have ever witnessed in the war." Prelude: After the initial attacks on Petersburg by Union forces ended on June 18, a portion of the IX Corps picket line, built under fire, was established only four hundred feet from Elliot's Salient, part of the main Confederate line. The Federals decided to construct and explode a mine underneath the salient in an attempt to surprise and overwhelm the Confederates and seize the heights above Petersburg and thereby shorten the siege. After several weeks of preparation the mine was exploded on July 30 at 4:45am. The Union sent unit after unit into the 200 foot-wide gap created in the Confederate line. The poorly-led Federal soldiers end up heading into the crater and not around it as planned. Though the Federals outnumbered the Confederates, they were unable to advance from the crater or easily retreat from it as the Confederates made both routes killing fields. The Fourth Division of the IX Corps, which consisted of regiments from the United States Colored Troops (USCT), were the last to enter the action. In this, their first engagement, they advanced farther than any other Federal unit. The main Confederate counterattack led by Gen. William Mahone (CSA) arrived shortly after this, drove back the USCTs and plugged the gap in the Confederate line. At 9:30 am, Gen. Ambrose Burnside (USA), commander of the IX Corps, received orders to call off the attack and any more support to the Union soldiers in the crater. The soldiers in the hole did not learn of this until 12:30 that afternoon. With the gap sealed, the Confederates slowly advanced on the crater and, in one final rush, pushed into the abyss itself. In what was the fiercest hand-to-hand combat of the entire siege, the Union troops, who still outnumbered the Confederates, surrendered to these determined defenders. As prisoners were taken to the rear, unarmed black soldiers who had been calling for "no quarter," were now shot down by some of their captors. Aftermath: After nearly ten hours of fighting and a combined cost of nearly 5,500 lives, nothing had changed tactically. Despite the battle being a tactical Confederate victory, the strategic situation in the Eastern Theater remained unchanged. Both sides continued in their trenches and the siege endured. In what may have been Gen. U. S. Grant's best chance at ending the Siege of Petersburg instead became a symbol of military debacle. As for the principal players, Mahone was promoted to Major General, Burnside was relieved of command, and Grant appeared before the Committee on the Conduct on the War. Grant wrote to Chief of Staff Henry W. Halleck, "It was the saddest affair I have witnessed in this war." He also stated to Halleck that "Such an opportunity for carrying fortifications I have never seen and do not expect again to have." Pleasants, who had no role in the battle itself, received praise for his idea and the execution thereof. When he was appointed a brevet brigadier general on March 13, 1865, the citation made explicit mention of his role. “General Burnside wanted to put his colored division in front, and I believe if he had done so it would have been a success. Still I agreed with General Meade as to his objections to that plan. General Meade said that if we put the colored troops in front (we had only one division) and it should prove a failure, it would then be said and very properly, that we were shoving these people ahead to get killed because we did not care anything about them. But that could not be said if we put white troops in front." Casualties: Union casualties were 3,798 (504 killed, 1,881 wounded, 1,413 missing or captured), Confederate 1,491 (361 killed, 727 wounded, 403 missing or captured). Many of the Union losses were suffered by Ferrero's division of the USCT. Both the black and white wounded prisoners were taken to the Confederate hospital at Poplar Lawn in Petersburg. Meade brought charges against Burnside, and a subsequent court of inquiry censured Burnside along with Brig. Gens. Ledlie, Ferrero, and Orlando B. Willcox, and Col. Zenas R. Bliss. Burnside was never again assigned to duty. Although he was as responsible for the defeat as Burnside, Meade escaped immediate censure. However, in early 1865, the Congressional Joint Committee on the Conduct of the War exonerated Burnside and condemned Meade for changing the plan of attack (which did little good for Burnside, whose reputation was ruined). As for Mahone, the victory, won largely due to his efforts in supporting Johnson's stunned men, earned him a lasting reputation as one of the best young generals of Lee's army in the war's last year. Analysis: One of the most well-known chapters of the Siege of Petersburg, its popularity saved itself from destruction. The plan for the Battle of the Crater called for the mine to be detonated between 3:30 and 3:45am, shortly before dawn, on the morning of July 30. Pleasants lit the fuse accordingly, but as with the rest of the mine's provisions, they had been given poor quality fuse, which his men had had to splice themselves. After more and more time passed and no explosion occurred (the growing light presenting an escalating threat to the men at the staging points, who were in view of the Confederate lines), two volunteers from the 48th Regiment (Lt. Jacob Douty and Sgt. Harry Reese) crawled into the tunnel. After discovering the fuse had burned out at a splice, they spliced on a length of new fuse and relit it. Finally, at 4:44 a.m., the charges exploded in a massive shower of earth, men, and guns. A crater (still visible today) was created, 170 feet (52 m) long, 60 to 80 feet (24 m) wide, and 30 feet (9.1 m) deep. Between 250 and 350 Confederate soldiers were instantly killed in the blast. Ledlie's untrained white division was not prepared for the explosion, and reports indicate they waited ten minutes before leaving their own entrenchments. Footbridges were supposed to have been placed to allow them to quickly cross their own trenches, but these were missing, meaning the men had to climb in and out of their own trenches just to reach no-man's land. 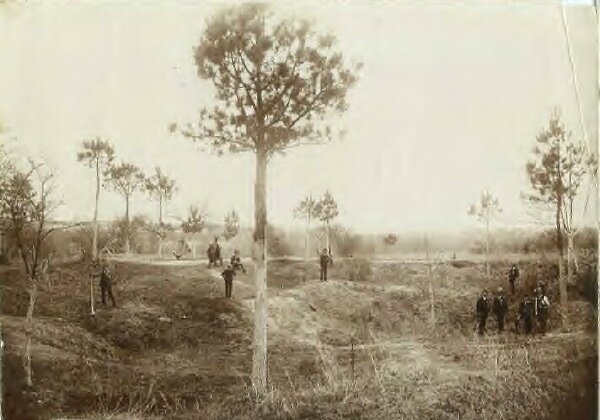 Once they had wandered to the crater, instead of moving around it as the black troops had been trained to do, they thought it would make an excellent rifle pit and it would be well to take cover. Therefore, they moved down into the crater itself, wasting valuable time while the Confederates, under Maj. Gen. William Mahone, gathered as many troops together as they could for a counterattack. In about an hour's time, they had formed up around the crater and began firing rifles and artillery down into it, in what Mahone later described as a "turkey shoot". The plan had failed, but Burnside, instead of cutting his losses, sent in Ferrero's men. Now faced with considerable flanking fire, they also went down into the crater, and for the next few hours, Mahone's soldiers, along with those of Maj. Gen. Bushrod Johnson and artillery, slaughtered the IX Corps as it attempted to escape from the crater. 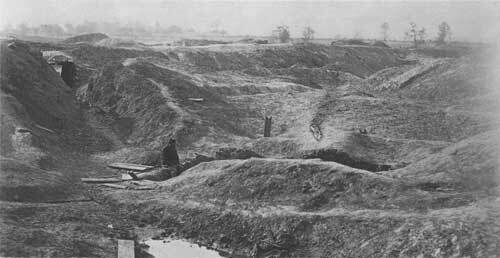 Some Union troops eventually advanced and flanked to the right beyond the Crater to the earthworks and assaulted the Confederate lines, driving the Confederates back for several hours in hand-to-hand combat. Mahone's Confederates conducted a sweep out of a sunken gully area about 200 yards (180 m) from the right side of the Union advance. This charge reclaimed the earthworks and drove the Union force back towards the east. The Confederates reported losses of 1,032 men in the battle, while Union losses were estimated at 5,300, about half of which were from Ferrero's division. Five hundred Union prisoners were taken, and 150 of these prisoners were USCT. Both the black and white wounded prisoners were taken to the Confederate hospital at Poplar Lawn in Petersburg. Burnside was relieved of command. Although he was as responsible for the defeat as Burnside, Meade escaped censure. As for Mahone, the victory, won largely due to his efforts in supporting Johnson's stunned men, earned him a lasting reputation as one of the best young generals of Lee's army in the war's last year. Grant wrote to Chief of Staff Henry W. Halleck, "It was the saddest affair I have witnessed in this war." He also stated to Halleck that "Such an opportunity for carrying fortifications I have never seen and do not expect again to have." Pleasants, who had no role in the battle itself, received praise for his idea and the execution thereof. When he was brevetted a brigadier general on March 13, 1865, the citation made explicit mention of his role. In 1926, Crater Battlefield Association acquired the land, established their own visitor center next to the Crater, and began constructing a golf course on the surrounding grounds. The Association opened a section of the tunnel in 1928 but the tunnel collapsed in 1930. By 1934, the organization went bankrupt and the golf course was closed. The federal government purchased this land in 1936 and the park used the existing visitor center until 1966 when the present day Eastern Front Visitor center was built. Today: The area of the Battle of the Crater is a frequently visited portion of Petersburg National Battlefield Park. The mine entrance is open for inspection annually on the anniversary of the battle. There are sunken areas where air shafts and cave-ins extend up to the "T" shape near the end. 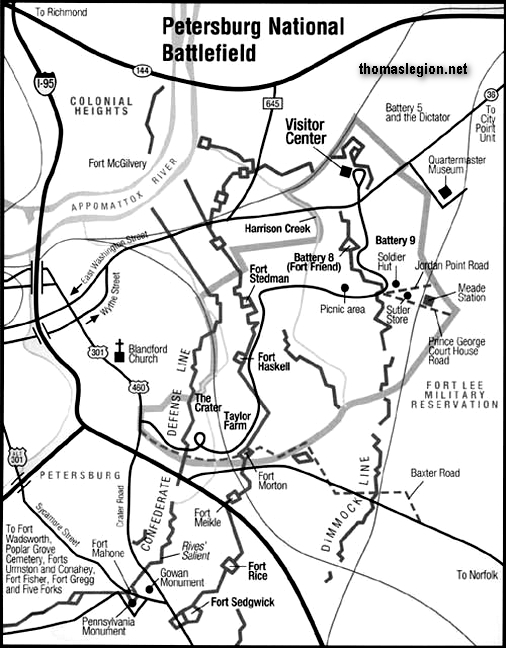 The park includes many other sites, primarily those that were a portion of the Union lines around Petersburg. See also Battle of the Crater, AKA Battle of the Mine: A Detailed Civil War History and Siege of Petersburg. Recommended Reading: Battle of the Crater (Civil War Campaigns and Commanders) [ILLUSTRATED]. Description: July 1864. Grant's siege of Petersburg is at a standstill. A Federal regiment made up mostly of Pennsylvania coal miners, under the command of Lt. Colonel Henry Pleasants, secures the reluctant approval of Generals Meade and, ultimately, Grant to pursue an outrageous strategy: tunnel under the Confederate trenches, and blow up the Confederate troops. The 586-foot tunnel is completed in a month. Continued below. Four tons of powder explode in a devastating surprise attack, killing hundreds of Confederate soldiers. Fearing bad publicity, white soldiers are substituted for the division of black troops specially trained for the assault. Ill prepared, and without leadership, they charge through Confederate lines and swarm around and incredibly, into the 170-foot crater, only to be trapped and slaughtered in a furious counter charge. An absorbing story of extraordinary bravery and incompetent leadership based on first-person accounts. Recommended Reading: Battle of the Crater : A Complete History, John F. Schmutz (428 pages) (McFarland). Description: Author John F. Schmutz, a US army veteran turned corporate attorney, has given us an exhaustive and detailed study of a massive wartime explosion gone awry in the summer of 1864. The disastrous Crater is well-known yet often times presented in spectacular fashion, but absent are the grueling details unfolding in the weeks and days and minutes prior to the earthshaking detonation. The Battle of the Crater is one of the lesser known yet most interesting battles of the Civil War. This book, detailing the onset of brutal trench warfare at Petersburg, Virginia, digs deeply into the military and political background of the battle. Beginning by tracing the rival armies through the bitter conflicts of the Overland Campaign and culminating with the siege of Petersburg and the battle intended to lift that siege, this book offers a candid look at the perception of the campaign by both sides. From an attorney's eye, why did the Mine fail? Who was to blame? But could it have actually worked? Answers to these questions and so many more are presented in Schmutz's lively and captivating prose. The Crater, nevertheless, is still just a single event that transpired over the nearly 10-month siege, so detailing and discussing its history in context is vital, and Schmutz masters it. One reviewer said that it is the most comprehensive work of the Crater, while another wrote that it is a well-written and readable volume for the ages. The author, having a soldier's mind and attorney's perspective, gives us a balanced and fair read that is gripping and rather difficult to put down. With 428 pages filled with photographs, illustrations, appendices, notes, bibliography, and index, it really has something for everyone. Recommended Reading: The Horrid Pit: The Battle of the Crater, the Civil War's Cruelest Mission (Hardcover). Review From Publishers Weekly: One of the American Civil War's most horrific events took place on July 30, 1864: the slaughter of thousands of Union troops, including many African-Americans, in a giant pit outside Petersburg, Va. “The Crater” was created as a result of a poorly planned and executed Union mission to tunnel under, and then explode, the Confederate lines, thereby opening the gates to a full frontal assault on Petersburg that, if successful, could have helped decide the war. Instead, after several hundred Confederates perished in the initial mine explosion, the Union troops entered the crater—later known as The Pit—and were gunned down. Continued below. The scene was popularized by Hollywood when it was re-created in the film Cold Mountain. Civil War specialist Axelrod (The War Between the Spies, et al.) offers a concise, readable and creditable recounting of the Battle of the Crater, which General U.S. Grant famously termed a stupendous failure. When the dust settled, the Union forces, under the inept leadership of generals Ambrose E. Burnside and George Gordon Meade, suffered more than 4,000 killed, wounded or captured. The well-led Confederates had about 1,500 casualties. The massive slaughter does not make for easy reading, but is a reminder of the horror of war at its basest level. Thus, in one decisive action, the Union would marshal its mastery of technology and resources, as well as demonstrate the superior morale generated by the Army of the Potomac’s embrace of emancipation. At stake was the chance to drive General Robert E. Lee’s Army of North Virginia away from the defense of the Confederate capital of Richmond–and end the war. The result was something far different. The attack was hamstrung by incompetent leadership and political infighting in the Union command. The massive explosion ripped open an immense crater, which became a death trap for troops that tried to pass through it. Thousands of soldiers on both sides lost their lives in savage trench warfare that prefigured the brutal combat of World War I. But the fighting here was intensified by racial hatred, with cries on both sides of “No quarter!” In a final horror, the battle ended with the massacre of wounded or surrendering Black troops by the Rebels–and by some of their White comrades in arms. The great attack ended in bloody failure, and the war would be prolonged for another year. With gripping and unforgettable depictions of battle and detailed character portraits of soldiers and statesmen, No Quarter compellingly re-creates in human scale an event epic in scope and mind-boggling in its cost of life. In using the Battle of the Crater as a lens through which to focus the political and social ramifications of the Civil War–particularly the racial tensions on both sides of the struggle–Richard Slotkin brings to readers a fresh perspective on perhaps the most consequential period in American history. About the Author: Richard Slotkin is widely regarded as one of the preeminent cultural critics of our times. A two-time finalist for the National Book Award, he is the author of Lost Battalions, a New York Times Notable Book, and an award-winning trilogy on the myth of the frontier in America–Regeneration Through Violence, The Fatal Environment, and Gunfighter Nation–as well as three historical novels: The Crater: A Novel, The Return of Henry Starr, and Abe: A Novel of the Young Lincoln. He is the Olin Professor of English and American Studies at Wesleyan University and lives in Middletown, Connecticut. Recommended Reading: In the Trenches at Petersburg: Field Fortifications and Confederate Defeat (Civil War America) (Hardcover). Description: The Petersburg campaign began June 15, 1864, with Union attempts to break an improvised line of Confederate field fortifications. By the time the campaign ended on April 2, 1865, two opposing lines of sophisticated and complex earthworks stretched for thirty-five miles, covering not only Petersburg but also the southeastern approaches to Richmond. This book, the third volume in Earl Hess's trilogy on the war in the eastern theater, recounts the strategic and tactical operations in Virginia during the last ten months of the Civil War, when field fortifications dominated military planning and the landscape of battle. Continued below. Hess extracts evidence from maps and earthworks systems, historic photographs of the entrenchments, extensive research in published and archival accounts by men engaged in the campaign, official engineering reports, modern sound imaging to detect mine galleries, and firsthand examination of the remnants of fortifications on the Petersburg battlefield today. The book covers all aspects of the campaign, especially military engineering, including mining and countermining, the fashioning of wire entanglements, the laying of torpedo fields, and the construction of underground shelters to protect the men who manned the works. It also humanizes the experience of the soldiers working in the fortifications, revealing their attitudes toward attacking and defending earthworks and the human cost of trench warfare in the waning days of the war. About the Author: Earl J. Hess is associate professor and chair in the Department of History at Lincoln Memorial University. Previous books in his series on field fortifications are Field Armies and Fortifications in the Civil War: The Eastern Campaigns, 1861-1864and Trench Warfare under Grant and Lee: Field Fortifications in the Overland Campaign. Recommended Reading: The Crater: Petersburg. Description: A spectacular early morning underground explosion followed by bloody hand-to-hand combat and unprecedented command malfeasance makes the story of the Crater one of the most riveting in Civil War history. Da Capo's new "Battleground America" series offers a unique approach to the battles and battlefields of America. Each book in the series highlights a small American battlefield-sometimes a small portion of a much larger battlefield-and tells the story of the brave soldiers who fought there. Using soldiers' memoirs, letters and diaries, as well as contemporary illustrations, the human ordeal of battle comes to life on the page. Continued below. All of the units, important individuals, and actions of each engagement on the battlefield are described in a clear and concise narrative. Detailed maps complement the text and illustrate small unit action at each stage of the battle. Then-and-now photographs tie the dramatic events of the past to the modern battlefield site and highlight the importance of terrain in battle. The present-day historical site of the battle is described in detail with suggestions for touring. About the Author: John Cannan has established a reputation among civil War writers in remarkably short time. His distinctions include three books selected by the Military Book Club. He is the author of The Atlanta Campaign, The Wilderness Campaign, and The Spotsylvania Campaign. He is an historic preservation attorney living in Baltimore. Recommended Reading: The 48th Pennsylvania in the Battle of the Crater: A Regiment of Coal Miners Who Tunneled Under the Enemy (Hardcover). Description: In June 1864, Grant attempted to seize the Confederate rail hub of Petersburg, Virginia. General P.G.T. Beauregard responded by rushing troops to Petersburg to protect the vital supply lines. A stalemate developed as both armies entrenched around the city. Union commander General Ambrose Burnside advanced the unusual idea of allowing the 48th Pennsylvania—a regiment from the mining town of Pottsville—to excavate a mine, effectively tunneling under Confederate entrenchments. One of the most inventive and creative conflicts of the war, the Battle of the Crater ultimately became one of the most controversial, as an almost certain Union victory turned into an astonishing Confederate triumph. Continued below. 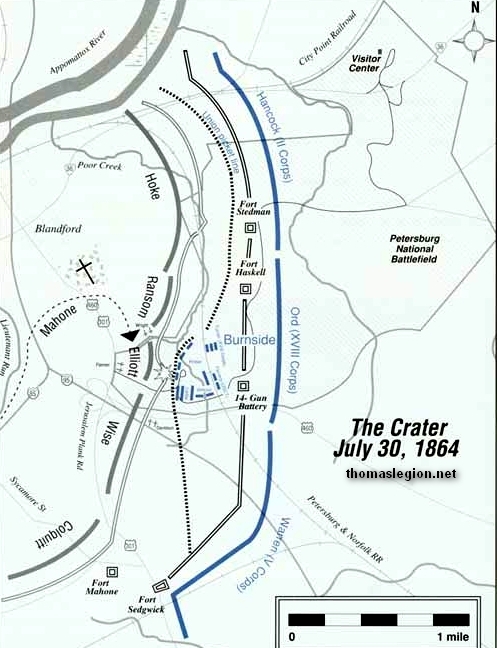 With special emphasis on the role of the 48th Pennsylvania, this history provides an in-depth examination of the Battle of the Crater, which took place during July 1864. Here, bickering between Federal commanders and a general breakdown of communications allowed shattered Confederate troops the opportunity to regroup after a particularly devastating blow to their defenses. The work examines the ways in which the personality conflict between generals George Meade and Ambrose Burnside ultimately cost the Union an opportunity to capture Petersburg and bring an early end to the war. On the other hand, it details the ways in which the cooperation of Confederate commanders helped to turn this certain defeat into an unexpected Southern achievement. Appendices include a list of forces that took part in the Battle of the Crater, a table of casualties from the battle and a list of soldiers decorated for gallantry during the conflict. Recommended Reading: Trench Warfare under Grant and Lee: Field Fortifications in the Overland Campaign (Civil War America) (Hardcover) (The University of North Carolina Press) (September 5, 2007). Description: In the study of field fortifications in the Civil War that began with Field Armies and Fortifications in the Civil War, Hess turns to the 1864 Overland campaign to cover battles from the Wilderness to Cold Harbor. Continued below. Blending technical aspects of construction with operational history, Hess demonstrates the crucial role these earthworks played in the success or failure of field armies. He also argues that the development of trench warfare in 1864 resulted from the shock of battle and the continued presence of the enemy within striking distance, not simply from the use of the rifle-musket, as historians have previously asserted. Based on fieldwork at 300 battle sites and extensive research in official reports, letters, diaries, and archaeological studies, this book should become an indispensable reference for Civil War historians. Sources: National Park Service; Official Records of the Union and Confederate Armies; Petersburg National Battlefield; National Archives; Texas Civil War Museum; Library of Congress; Civil War Preservation Trust; Bonekemper, Edward H., III, A Victor, Not a Butcher: Ulysses S. Grant's Overlooked Military Genius, Regnery, 2004; Catton, Bruce, A Stillness at Appomattox, Doubleday and Company, 1953; Catton, Bruce, Grant Takes Command, Little, Brown & Co., 1968; Corrigan, Jim, The 48th Pennsylvania in the Battle of the Crater: A Regiment of Coal Miners Who Tunneled Under the Enemy, McFarland & Company, 2006; Davis, William C., and the Editors of Time-Life Books, Death in the Trenches: Grant at Petersburg, Time-Life Books, 1986; Eicher, David J., The Longest Night: A Military History of the Civil War, Simon & Schuster, 2001, Johnson, Robert Underwood, and Buel, Clarence C. (eds. ), Battles and Leaders of the Civil War, Century Co., 1884-1888; Horn, John, The Petersburg Campaign: June 1864 – April 1865, Combined Publishing, 1999; Kennedy, Frances H., ed., The Civil War Battlefield Guide, 2nd ed., Houghton Mifflin Co., 1998; Salmon, John S., The Official Virginia Civil War Battlefield Guide, Stackpole Books, 2001; Trudeau, Noah Andre, The Last Citadel: Petersburg, Virginia, June 1864 – April 1865, Louisiana State University Press, 1991.